As the days get colder, most pool owners begin the process of packing up their pool for the winter. Well, now you can enjoy your pool all year round with heating options available to suit all needs and budgets. Why settle for covering up your pool this winter when you can have lovely warm water to settle into on the chilly days to come. 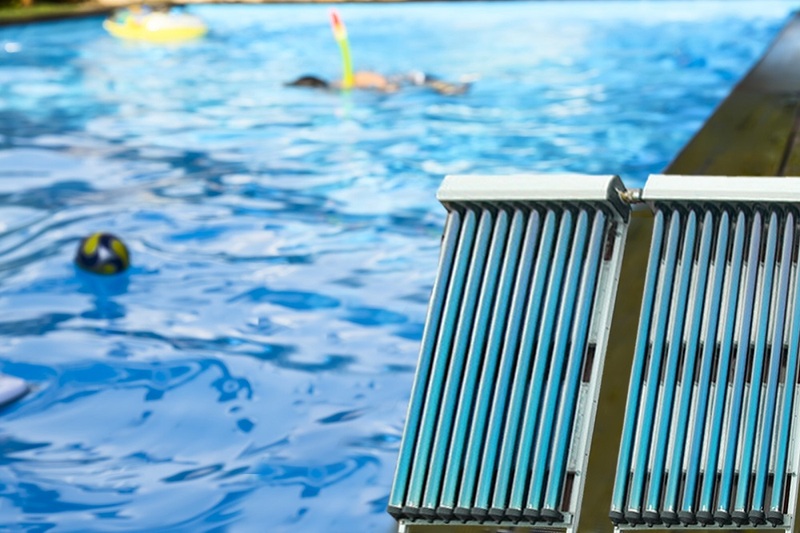 Here we’ll provide some details on the pros and cons of the four pool heating system types: solar, gas, electric heat pump and electric element. PROS: Solar pool heating has one obvious advantage in that it utilises energy from the sun at no cost to you. This system is fantastic for recreational pools used mostly in the warmer months and sparingly in Autumn and Winter. Your only costs for solar panel heating are initial installation and the recommended booster pump. CONS: This system relies solely on weather conditions and operates at peak performance on cloud-free Summer days, meaning it is not as effective in the cooler months. You’ll need to consider the position of your roof and pool for maximum efficiency, as well as any large trees that could block the panels. How much your pool is affected by shade and wind should also be considered. PROS: An electric element is typically cheap to buy and easy to install. This system is ideal for pools that can’t meet the requirements of gas and heat pump heating. CONS: Although electric elements are the least costly out of the bunch, you will need to moderate use to save yourself money in ongoing costs. You may also find that your electric element system will have trouble drumming up enough power to heat a freezing cold pool in Winter, with there being more cold water than the heater can handle. PROS: The electric heat pump is perfect for keeping your pool warm all year round. Because these systems work by taking the heat out of the air and transferring it to the pool, an electric heat pump operates best in warm temperatures, however, are capable of maintaining comfortable pool temperatures in the cooler months. The electric heat pump is also the lowest cost option for year-round heating. CONS: Electric heat pumps generally don’t last as long as other heating options. PROS: Gas heaters are by far the best option in regards to their rapid heating ability and flexibility. This system can easily maintain desired temperatures, being capable of a 14oC rise in as little as 24 hours. Although gas heater costs are relatively low, it’s ideal as an add-on to a solar heating system in bad weather and at night. CONS: The installation and purchase of a gas heater can be more expensive than other pool heating options. Repairing a gas heater can also be incredibly expensive and it is not recommended that you attempt repairs yourself. As you can see, there are many options available for keeping your pool warm and cozy in the cooler months to come. If you are unsure what system is right for your pool and your needs, don’t hesitate to contact the friendly team at Cozy Pool & Spa. Our specialists can also repair and install pool heating systems on the Gold Coast – just call 0459 684 612.